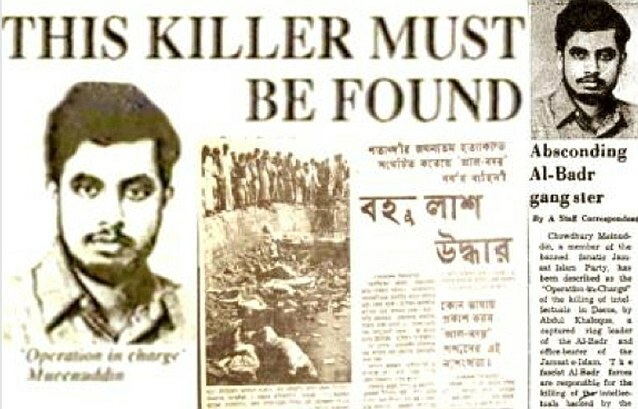 Photo: Editor of newspaper Purbodesh – Atiqur Rahman – published a front page claiming that Chowdhury Mueen-Uddin, a former reporter, had been a murderer. Source- Mail Online. On Sunday, the British broadsheet The Daily Mail, reported that Bangladeshi prosecution investigators connected to the International Crime Tribunals-Bangladesh had finished their investigations into the suspected war crimes of Chowdhury Mueen-Uddin and Ashrafuzzaman Khan. After the Liberation War of 1971, both men escaped the newly formed state of Bangladesh looking for shelter in the West. Mueen-Uddin went to the United Kingdom and Khan to the United States. The pair had allegations of war crimes, torture and murder hanging over them, however they managed to build successful lives in their self-imposed exiles. They had both been sucked into the politics o­­­f Jamaat-i-Islami in their youths. They like many others had fallen under the spell of Maulana al-Mawdudi, one of the most prominent Islamist ideologues and practitioners of modern Jihad. Mawdudi believed in the supremacy of his party and their beliefs. Mawdudi believed that all forms of governance, unless his party were in leadership, were un-Islamic. Khan and Mueen-Uddin had been active in Jamaat politics in Bangladesh. When Bengali nationalists led by Sheikh Mujibur Rahman demanded political autonomy and freedom in 1971 the West Pakistani regime demanded they be quashed. Jamaat was used by the Pakistani regime to setup paramilitary death squads to punish those that supported independence. The tribunals in Dhaka believe that Khan and Mueen-Uddin were the ring leaders in these heinous acts of barbarity. In the winter of 1979, a young Saudi travelled to Pakistan meet with the Amir, the leader, of Pakistan’s most organised religious political party, the Jamaat-i-Islami. The Saudi Embassy had sent a message to Qazi Hossain Ahmed to tell him that a bright, focussed believer was heading their way. His mission was to bring money and support for the Afghan Jihad. Pakistan and the Inter-Service Intelligence (ISI) had used Pakistan’s religious parties for the jihad. The Jamaat-i-Islami had rallied the Muslim world to the Jihad which was called after the Soviet invasion of Afghanistan in December 1979. The young Saudi was called Osama bin Laden and this was the start of a three decade relationship with the Jamaat movement in South Asia which has had severe implications for the rest of the world. After the Soviet Jihad, Bin Laden tried to help setup the Islami Jamhoori Ittehad (IJI) with the help of Jamaat. It was an Islamic coalition designed to stop the rise of the Pakistani People’s Party (PPP). It has been alleged in Pakistan’s Supreme Court that the Mehran Bank was used by the ISI to help fund the coalition. Bin Laden became part of Pakistan’s political furniture. Jamaat leaders also went to meet with bin Laden while he was in exile in Sudan during the 1990s. Jamaat has publicly rallied for Jihad funds for numerous conflicts. Jamaat have also been accused of helping to fan conflicts way beyond Pakistan. In the early 1990’s Jamaat was helping young Uighurs to come for religious training in Lahore, Pakistan. They were diverted to militant camps instead. The Chinese, Russian, Iranian and Indian governments complained about the covert, yet transparent funding of foreign mercenaries by Pakistan and Jamaat. Russia’s Supreme Court blacklisted Jamaat for supplying funds to mercenaries and jihadi fighters. In 1979, while the Jihad was raging in Afghanistan, Chowdhury Mueen-Uddin, was now living in London, forging his career with other Jamaati figures that had sought refuge away from South Asia. They setup front organisations such as the Islamic Foundation in Leicester, United Kingdom Islamic Mission (UKIM), East London Mosque, and Dawatul Islam. Mueen-Uddin would later play a role in helping Bin Laden and Jamaat’s relationship to cause more human tragedy in South-East Asia. While in exile, Chowdhury Mueen Uddin build his career in Jamaat’s diasporic politics. He become a trustee and treasurer of Muslim Aid, the UK’s largest Muslim charity. He would also become the Chairman of the Islamic Foundation in Leicester, which was founded by Prof. Khurshid Ahmed, a Pakistani leader and senior politician in Jamaat-i-Islami. The aim of the foundation was to stop the secularisation of Muslims that had moved to the UK from the Indian subcontinent. It was also used to push the thought of Mawdudi in Europe. I have previously written about Chowdhury Mueen-Uddin’s involvement in the financing of an al-Qaeda and Jemaah Islamiyah front called KOMPAK in Indonesia. KOMPAK helped to setup military camps, funnel arms and explosives to militants and was visited by al-Qaeda leaders such as the late Omar Faruq, one of Bin Laden’s key lieutenants and Ayman al-Zawahiri, the new leader of al-Qaeda. ABC News Australia commissioned an expose into the links of Muslim Aid and KOMPAK. The Australian leaders said it was a mistake, however it was later uncovered that Muslim Aid and Jamaat fronts continued with their financing of the Jemaah Islamiyah charity. The financing of KOMPAK by Muslim Aid had started in 1998. In 2000, Muhammed Hafidz, one of the directors of KOMPAK came on a European Tour to highlight atrocities committed during the sectarian conflicts in the Molucca Islands, Indonesia. He also came looking for donations. He visited Muslim Aid offices, Amnesty International and Muslime Helfen (Muslim Aid Germany). Three years later, Hafidz would be arrested for giving safe haven to two of the Bali bomb makers, Umar Besar (aka. Wayan and Abdul Ghoni) and Sarjiyo (aka. Zaenal Abidin and Sawad). They were staying in his apartment building in the Limus Estate in Bogor, West Java when counter-terrorism officers raided the premises. Hafidz was arrested as part of the crackdown on Jemaah Islamiyah operatives in April, 2003. However, he was later released due to lack of evidence. Some of his fellow directors of KOMPAK weren’t so lucky. They were charged with terrorism related offences and are still in prison for being affiliated with al-Qaeda. It isn’t the first time Muslim Aid has been accused of supporting Islamic causes and terrorism. Andrew Gilligan of The Daily Telegraph has chronicled the charities support for Hamas. This isn’t a surprise as Jamaat politicians and leaders from Bangladesh and Pakistan have all professed their admiration for Hamas and other groups. Muslim Aid is staffed by those affiliated with Jamaat politics, so it couldn’t come as a surprise when they are accused of funneling money to jihadi causes when their brothers, leaders even, in Pakistan and elsewhere are calling for it publicly. Chowdhury Mueen-Uddin case isn’t just confined to the politics of Bangladesh. His whole career needs to be investigated fully. His career from suspected war criminal to suspected terrorist financier needs to be investigated by British authorities as a priority of national importance and security. This is the joint activities of so call Jammat party ,their supporters pakistani ISI and other fundamentalist groups. Bangladesh government must co-ordinate to the foreign counterparts to bring them for justice and make the world free of such activites. wow your churnalism just gets worse and worse. you should purchase a join the dots book and focus on reading in a straight line.